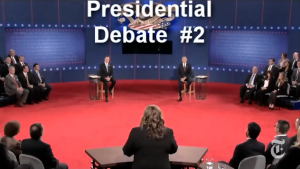 In the second of three Presidential Debates, the Town Hall setting offered the candidates the chance to move freely in an open area. This allowed for an in-depth review of of performance issues, including body language, eye contact, hand gestures, proximity, navigation, confrontation and speaking style. Non-verbal cues dominate during planned or prepared speaking venues and both candidates were prepared not only to discuss the issues, but to directly confront one another in the process. In this debate, Barack Obama redeemed himself from his previous lackluster performance by adding action, energy and a sense of leadership, while Mitt Romney remained steady, similar to the way he appeared in the first debate.